It’s officially Halloween! 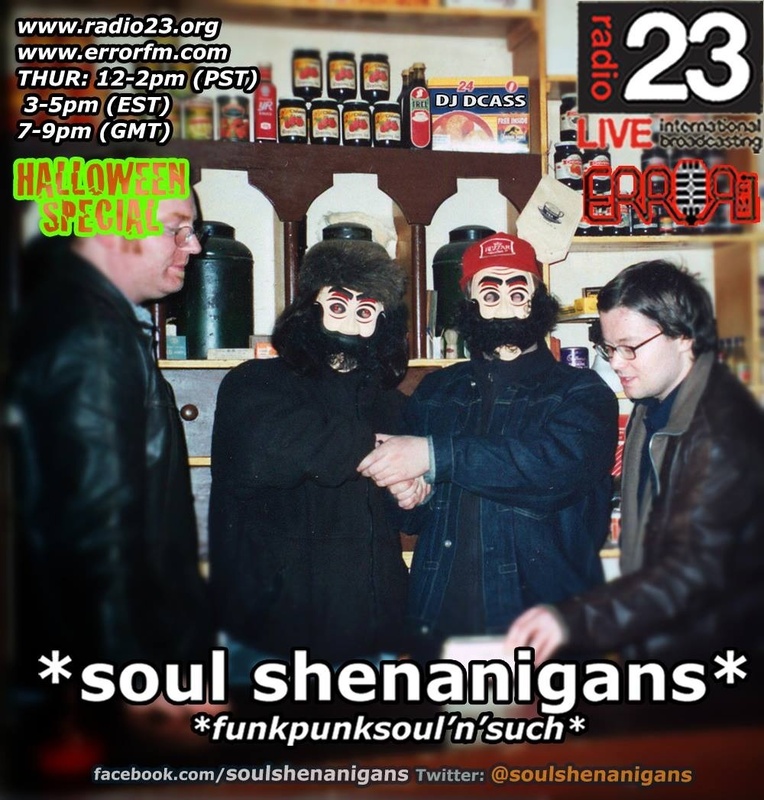 I wish to give a plug to my hubby, iDJ, and his weekly international radio show, SoulShenanigans. He will be in the air tonight from 7 to 9pm Greenwich Mean time, or 3 to 5pm US Eastern time. Please give him a listen live, if you can – or alternately I will be posting a link to the podcast once the show is over. He’s been working on this all year, it should be a really fabulous show! And you can talk to him while he is live on the air, if you want to! Will try to catch it tonight but will listen to the podcast if I miss the live show. What fun! Thanks! I’ve been listening for a half hour, it’s good! Hum! I thought you had make a mistake in your timezone calculation… But I just logged in and heard DJ Dcass’ voice. Is it that you’ve already set time back from daylight saving? Sometimes it is two weeks out – makes it very hard on us with the show! I get that! But well, first time I can listen to it live. I’ll still have to listen to the podcast to catch back the first 70 minutes which I missed. David isn’t American! He just (lawd knows why) really likes the place. No no! I knew! I said that because neither of you is American. You aren’t American anymore, you told me many times. He… what???? Hum… I didn’t notice anything going wrong! Iron Maiden…. This one makes me old… I so listened to that one in the late 90s!! Oops! Something indeed went wrong… Radio Tweny-Tree doesn’t play anything anymore, it cut right into … number of the beast! And I just saw the Obama thing – AHAHHAHA! “Thanks, Obama!” I’m sure he had everything to do with it! Hahah now there is a time change law? is an “act” a synonymous for “law”? If so, it is indeed a law. Starting in 2007 (thanks to Wikipedia, I didn’t realized it was this long ago already), the Energy Policy Act of 2005 made a change to the Uniform Time Act of 1966 (thanks again to Wikipedia for these names lol), which made the DST 4 weeks longer than before. The idea was to same even more on lighting, and also according to some to allow children to treat-or-trick in more sunlight in the evening… but someone hadn’t made his homework correctly. This is the 21st century and lighting is no more the most important use of electricity. While the change indeed allowed to save on lighting, it resulted in more electricity used for heating in the northern states, and in Canada. The change was overall stupid, unnecessary and gay. Alright, it has nothing to do with gays, but “stupid and gay” is a common English expression. According to YouTube. Gosh darnit! I missed it…. Oops, just realized there’s a podcast….will check it out. Yay! Oh, I wanted to say that of all the lads I work with, the one I goof around with the most is named Liam – and his dad works there too! Mick in my ‘heavy machinery’ post. Liam’s a good lad – in fact I’ve never met a bad one with that name. I think you chose well!